The myth is: California teens want to get their driver’s license as soon as they turn 16. It’s not that simple. I got my license when I was 22 (living in San Francisco and Berkeley, public transport is good and it is impossible to park, so why bother?). My son-in-law has a license but neither my 23-year-old daughter nor 19-year-old son have progressed past the permit stage. Like me, my daughter graduated from college without a driver’s license. In contrast, my husband got his license at age 14-1/2, growing up in Kansas farm country. Driver’s licenses have been more a passionate subject for discussion with my parents than with my kids. Before he passed away last year at age 85, my father lost his license after medical tests indicated that he could no longer driver safely. He was bitterly resentful of this, and we in his family were grateful that the consulting doctor took some of the heat of my father’s anger and frustration. My father saw the license suspension as an assault on his independence. It is surprisingly difficult to revoke a driver’s license. The California Department of Motor Vehicles (DMV) has many web pages about senior driving safety and complex formal rules about how to evaluate driving competence. Clearly, there are many (unlike my kids) for whom a driver’s license is an essential indication of maturity and freedom. Phoning the DMV gets you into a phone-tree-hell from which nothing results. Informal notes from doctors (even on doctor’s office stationary) get ignored – the DMV only responds to official forms and evaluations. Going in person to the DMV just gets you into long lines – where you eventually are told that the DMV does not perform driver’s tests at the request of concerned family members. What finally worked: a doctor submitting a signed “Request for Driver Reexamination” form to the DMV. In considering this blog entry, I found a listing of over 100 songs about cars and driving. For fun, listen to Joan Joffe Hall reading her poem Driver’s License, one of many creative tributes to this complex public document. Nowadays, I am the happy driver of a tiny Smart Car with a wrap that looks like party streamers. 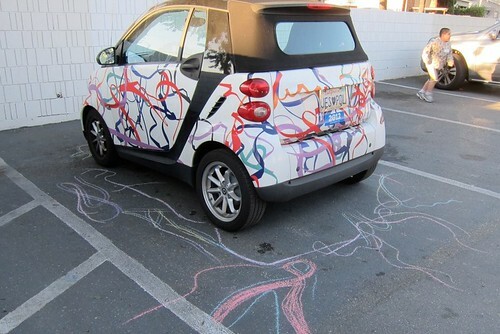 Recently, the kids at SMUM decorated around my car with sidewalk chalk, as if my car design was dripping onto the asphalt – the best kind of graffiti!